खबर लहरिया » Computers – but only to look at! Aura village, Tariyani block, Sheohar District, Bihar. In the government secondary school here, and in Salempur secondary school, computers sit on the desk, but there is no power to run them. Neither is there diesel to run generators for back up. Ashok Kumar, a teacher at Aura secondary school, said that IL&FS company had donated three computers to the school in 2007, all three of which are in need of repair at the moment. 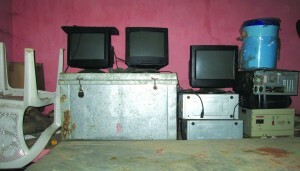 The headmaster Umashankar Prasad said that there was a computer operator hired for a year, which ensured that the students learnt how to use the computers, but there were many problems of power shortage. The computers couldn’t run without backup. Applications had been given to the district administration for repairing of the computers, and to have diesel organised, but no action has been taken so far. The computers are being kept without much use for them. 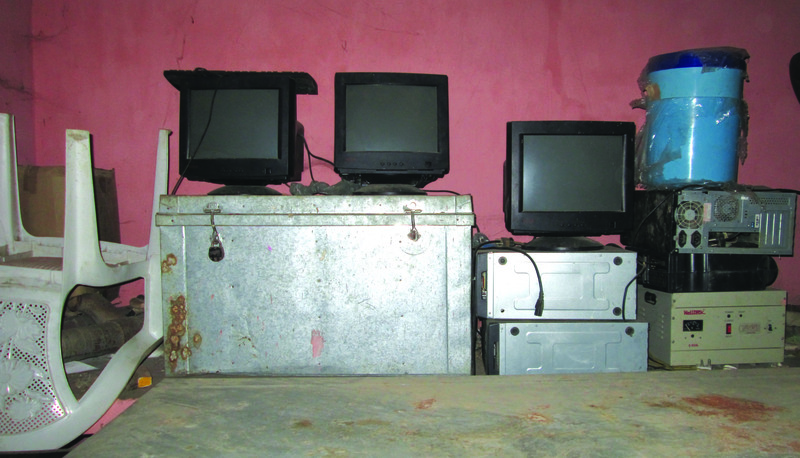 The teacher at Salempur secondary school says there are four computers here but no money to procure diesel. In 2009, three teachers from the school were given a six-day training. One of these, Asgar Ali, said that the training was under the Sarva Shiksha Abhiyan programme. He has not been able to practice what he learnt in the training. It was a matter of some surprise that no official from the Education Department had anything to say on this matter. The District Education Officer, Satyendra Narayan Prasad Yadav said that this is within the Sarva Shiksha Abhiyan programme; and the District Programme Officer Pramod Sahu said that he had no knowledge about it at all. The District Magistrate Vinod Kumar said that there had been a report requested on this matter, and so after he was better informed, action would be taken.